Blue light emitted from the screen of computer, TV, and smart phone reaches deeper into your eyes and could cause fatigue, dry eyes, headache, and even permanent damage to your retina. Through a patented procedure, a special coating was applied to the Archgon lens to block the harmful blue light and UV, thus wearing Archgon glasses could provide a much needed protection for your eyes. The frame is made by "Titanium"---a special light weight material---and the glasses would remain comfortable to wear for extended period of time. There are several attractive design of frame to choose from to suit your individual style. The GL-B191-K glasses shown here is designed for use by professional like graphic designer, computer engineer who's work requires ultimate color accuracy, but it is also great for general purpose use. 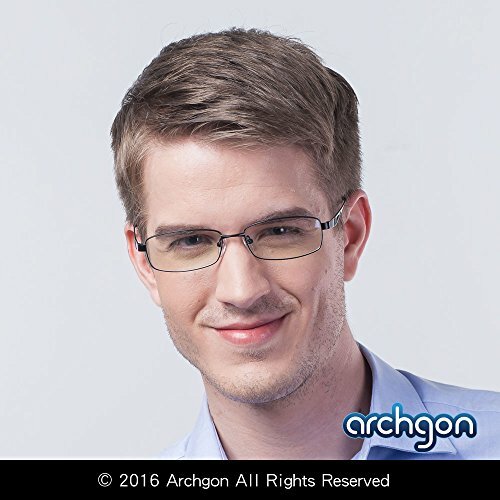 The Archgon glasses come with a 30 days money back return guarantee and a one year warranty. 57.89% Blue light blocking percentage. 99% UV Protection. Tested by SGS, a Swiss-based lab. Note: 100% of blocking percenatge will cause "color variation"